It is the intention of this writer to completely cover all phases of shoulder training in this thorough work, so that each reader, according to his own ideals, can be fully successful in his training. Exercises are strength and muscle building tools and as such, the same exercise can often be used to perform several jobs. Just as the same paint brush can be used regardless of whether the paint being applied is white, black or any other color, the same exercise can many times be used for building definition, bulk or power. This interchangeable application of exercises is controlled by the exercise principles employed. High repetitions and a strict exercise form tend towards inducing muscle molding and definition; lower repetitions, heavier weights and a looser style produce bulk; performing exceptionally ow repetitions, high sets, and using limit and near-limit poundages results in maximum development of power. Generally, the same exercise or exercises can be used for almost any bodybuilding aim, PROVIDED that the exercise principles are adhered to fit the goal in mind. Therefore, I will now outline the exercise principles that you are to follow, regardless or WHAT exercises you use, for making them give you either shaping, bulk, or the limit of power, according to your own specific desires. For the moment, let us forget about actual exercises, or even that this is a discussion on shoulder training. For the principles of bulk training to be revealed here, as well as the information about definition and power which will immediately follow, can be applied to any exercises for any part of the body. Later on I will give you graphic illustrations of their direct use in your shoulder training, along with ideas on routines, sets, repetitions, exercises and so on. But right now, permit us to confine ourselves to generalities, and how different principles can produce different developmental results. 1.) exercise programs should be kept short. 2.) high repetitions should be avoided. 3.) no bodypart should be trained more than 3 times a week. 4.) a substantial diet is urgent. 5.) more that usual sleep, rest and relaxation must be obtained. 1.) The energy factor is important when striving for bulk. Long workouts tend to drain the energy store and to burn off more muscle tissue than can be replaced during normal periods of rest. Long workouts also tend to place the thin lifter under nerve strain, which makes it harder for him to gain. In all, not more than 12 different exercises should be followed. If a certain part of the body is being specialized on, such as the arms, chest, shoulders, etc., then 4 different exercises should be selected for that part, and the balance of 8 exercises spread over the rest of the body. If no particular part of the body is being specialized on, then evenly spread the 12 exercises over the major muscle areas. You can alter your training routine every few months and in that way include every known exercise in your workouts over a period of time, but so not perform more than 12 exercises in any single workout when training for bulk. 2.) Since high repetitions tend to be exhausting and tend to drain the energy stores, they should be avoided in a bulk program. 6 to 8 repetitions a set, 3 sets of each exercise, using maximum weights, has been proved as the best bulk training procedure in the vast majority of cases. 3.) After any part of the body is exercised, it rebuilds broken down tissue and adds extra muscle size during rest periods. Rest periods between workouts must be long enough to permit the rebuilding and growth. If a thin lifter exercises any bodypart more often than 3 times a week, there will not be enough resting time to permit the muscle to grow. Therefore, on a bulk program, the individual does best in training the entire body 3 times a week, or else if he prefers, he can exercise the upper body one day and the lower the next, totaling 6 workouts a week. But, since each bodypart is exercised only 3 times a week in this manner, it will have ample rest and will grow in size. If any bodypart is trained more often than 3 times a week, this growth process will be interfered with. 4.) Foods for bulk are those high in calorie content, particularly. A calorie is that part of any food eaten which the body can utilize for energy. Calories are needed night and day by the body to sustain life’s processes and to supply energy for exercise and work. The more active the individual is, the greater his caloric requirements. If he obtains less calories daily than he needs to supply the energy requirements of his body, he will lose weight. If he obtains the exact number of calories from his food daily to attend to his energy requirements, he will sustain his bodyweight, or in other words, he will neither gain nor lose weight. If he secures MORE calories from his daily diet than he needs to attend to his energy requirements, then this excess will be stored in the body in the form of flesh and the individual will gain weight. The underweight lifter who is eager to gain weight quickly should obtain between 4000 and 5000 calories daily. Certain foods such as creamed soups, malted milks, bread and butter, nuts, raisins, dates, beans, lamb stew, stewed fruits, gravy, mayonnaise, cream, fresh ham, candied sweet potatoes, cranberry sauce, duck, stewing chicken, biscuits, waffles, mashed potatoes, bananas and hot chocolate, to mention a few typical foods, are high in caloric content. However, while these will add up to a heavy calorie intake, the necessity of low calorie foods to round out the diet and to supply vitamins and minerals which are needed for good health must not be overlooked. The weight gaining diet, therefore, while heavy in high calorie foods, should include ample quantities of fresh fruits, vegetables, whole grain products and other healthful foods which are not exceptionally high in calories, but are still needed by the body for good health. In addition to regular meals, the underweight lifter can enjoy a few between meal snacks which will not disturb normal appetite, but which will add valuable amounts of calories. A malted milk, drunk about 2 PM, will not interfere with the appetite for supper, but will add from 400 to 800 calories to the diet, depending upon its sweetness and quantity. A dish of easily-digested jello, a glass of milk and a few graham crackers, eaten shortly before retiring for the night, will not disturb sleep, nor appetite for breakfast and will add some 400 calories to the daily intake. Eating a dozen dates, or nibbling on a handful of dried raisins while reading a book or watching TV in the evening will jack up the caloric intake by 200 to 400 calories and will not impose any digestive hardship. You can buy a handy calorie counter book at any bookstore, costing only a few cents, and quickly learn the foods which contain the most. Then, include these in your diet, and continue to eat generously of fresh fruits, salads, green vegetables, whole grain products, and other vitamin-mineral rich food items and you can easily obtain the calories you need for gaining weight and still eat healthfully. 5.) It is during rest and relaxation that muscles build up best. The really thin lifter will not be getting too much sleep if he tries to obtain 10 hours nightly until his bodyweight is close to normal. Any bodybuilder who is interested in gaining weight should strive for between 8 and 9 hours sleep nightly. Less than 8 hours sleep is too little for gaining weight. Aside from large quotas of sleep, the underweight individual should relax and rest as much as possible during the day. Calories are used most when a person is active. They are conserved when he is resting. Therefore, gaining weight is faster if you use your energy mainly for exercise which stimulates muscle growth, and then, when not training, rest as much as you can. The principles which control definition training are: 1.) perform a wide variety of exercises. 2.) perform rather high repetitions. 3.) train the entire body more than 3 a week. 4.) avoid fattening meals. 5.) get a full allotment of refreshing sleep, but otherwise be active during the day. 1.) Since the real purpose behind definition training is to burn off fleshy or fatty excesses which hide muscularity, the workout intensity must be stepped up to the point where MORE TISSUE is burned off the body than can be replaced during rest periods. The muscles of the body must also be attacked from every angle during a workout, to make certain that deposits of fat or excess flesh which has lodged on any part of the body or on any part of a general muscle area is given direct muscle action. One or two exercises for any general muscle part will not produce this desired effect. The shoulders, with their multi-muscle action, and their three separate muscle heads, need a variety of exercises to promote definition throughout their entire structure. The waist, lower back and sides, thighs, chest and other parts of the body where excess flesh quickly lodges, must be treated to a rather large number of different exercises. It is not too much to perform 20 or more exercises for the entire body in a definition routine and each exercise should influence the various muscle parts from a different angle. 2.) In bulk training the energy must be conserved as much as possible. In definition training, there should be a real drain on the energy every workout. Body tissue must be broken down in such a large quantity that it cannot be replaced during rest periods. Then, and only then, will the individual chisel out hard musculature. Higher than normal repetitions, from 15 to 20 each exercise, 3 sets an exercise, continues the tissue breaking down process longer than lower repetitions. Such high repetitions are a drain on the energy, and the lifter will feel tired after such a workout, but if he obtains adequate sleep and eats healthfully, he will rebuild his energy from workout to workout, even though he will not replace all the tissue that has been broken down. The lost tissue will be fat, however, which is useless to him from a physique standpoint, so there will actually be no loss to the body. High repetitions, therefore, tend to toughen up the body, to remove fatty deposits and to bring out muscularity. They are urgent for the bodybuilder anxious to obtain more definition. 3.) While higher than normal repetitions and the use of more than the usual number of exercises in a workout are both urgent for increasing body definition, even these two vital principles must be assisted by a third for faster definition results. Flesh forms most readily on the body during periods of rest. Therefore, the lifter interested in definition, must train more frequently each week than his counterpart who is interested in bulk. Five to six workouts per week, each workout covering the entire body, is not too much. This will limit rest periods, will guard against the forming of fatty tissue, but at the same time, if sufficient sleep is obtained, the muscle structures will be rebuilt and improved. Even if the lifter feels slightly tired and muscularly sore from workout to workout when following such a frequent exercise plan, he should persist. He simply will not acquire hard muscularity unless he trains hard and often. On occasion, he can enjoy the luxury of an extra day or two of rest if he feels he is going stale, but otherwise he should drive himself as hard as possible by training often and strenuously. 4.) Diet for definition is naturally important. Approximately 3000 calories should be the daily limit. And fried, fatty, starchy foods should be avoided. Nibbling between meals is also a fattening habit. However, a non-fattening diet can be a substantial one, if certain points are followed. As an example, a baked potato contains about 100 calories. As a staple food item, this is not too high. However, place a pat of butter on the potato, and up the calories go some 75 in number. Bathe the potato in rich, brown gravy and you add another 100 calories, ending up with close to 300 calories instead of the original rather moderate 100. A lettuce and tomato salad contains an innocent 20 calories. Add a tablespoon of mayonnaise and you end up with 120 calories. A cup of beef bouillon holds only 25 calories while a similar serving of creamed soup contains 200. A dish of raw onion hides a mere 10 calories, but if you fry the onion in butter or fat it laps up 65 extra calories. 8 stalks of asparagus will give you only 18 calories while a small serving of baked beans packs some 300 calories in a few mouthfuls. Therefore, you do not have to go hungry on a low calorie diet. You can actually eat as much as you want. But select low calorie items as much as possible. If you eliminate rich, creamed, and sweet items from your diet, and cut down on the typically starchy foods, you can eat just about everything else and never have a worry about exceeding your calorie quota. 5.) While you cannot, for the sake of your health, cut down radically on your full 8 hours of sleep each night, at other times you should be active. Walk more, enjoy some active hobby, dance, participate in some moderate sport over weekends, and in all ways lead an active, vigorous life. If you add such daily activity to your workouts, you will further lessen the chances of fleshy formations on the body and will speed up your definition progress. Training for a maximum of strength cannot be compared to any other form of exercising. For, in power training, physical appearance becomes relatively unimportant, and strength becomes the dominant factor. There can be no compromise if you are really interested in building up your strength to record-shattering standards. Of course, a lifter who goes on a power program and who loses some of his physical perfection as a result can always alter his training at some future time and re-acquire proportion and muscularity. But, out and out power training should not be entered into by the bodybuilder unless he is willing to make certain sacrifices in body appearance. The exercise principles for maximum power are: 1.) train only on one or two exercises at a time until you have reached a peak performance in them. 2.) do not set any definite schedule for exercise frequency. 3.) when not training, you must obtain a lot of rest. 4.) your diet must be very substantial. 5.) you must acquire and maintain the proper mental approach. 1.) It is not unusual for champion weightlifters who excel in the three Olympic lifts to be beaten by experienced bodybuilders in such exercises as the bench press, curl and pullover. This in no way means that the Olympic lifter does not possess the potential to bench press, curl and pullover record poundages, but it does mean that by concentrating on a few lifts he had built up maximum power in these lifts. If he spread his efforts over a wider range of movements, he could never reach the peak of his power in any of them. The bodybuilder should learn by the weightlifter’s experience, and when on a power binge he should concentrate his efforts on one or two exercises entirely. If he does this he will achieve maximum power, partly because he is not spreading his supply of energy too thin over too many different movements, and partly because in concentrating entirely of a few movements he learns every trick of the trade – exactly how to start the weight how to get a rebound, how to adjust his body position, place his grip, how to breathe during the lift and so on. He becomes completely familiar with every phase of the exercise and can, because of this, lift more in it. 2.) Training energy is not a consistent factor. Every lifter will be stronger on certain days and weaker on others. Sometimes there is a definite reason such as having to work harder at the job, getting less sleep than usual, or emotional stress, which can reduce training energy. Othertimes, when a lifter feels lazy and listless, he has merely hit the bottom curve of his energy cycle and automatically he will possess more power in the coming days. The power enthusiast should learn to immediately recognize his days of high energy and his days of lower than usual energy. Nothing is gained by trying to break a record when the energy is low. This is bound to be discouraging and will only decrease further the sub-normal store of energy at that particular time. On the other hand, when the lifter is riding a high energy crest, there is no sense in resting on a certain day merely because he has worked out the day before. Instead, he should work out daily on his high energy days and less frequently when the energy is lower. It will require considerable experience before the lifter will be able to accurately determine high energy, usual energy, and low energy days. But, he will have to train himself to recognize these variances in his energy cycle and to train accordingly. When the energy is about normal, and rather consistent weights can be handled from workout to workout, training 3 times a week is best. When the energy is low training twice or even only once that week is best. When the energy is exceptionally high, training 3 or 4 days in a row might well show a boost in poundage each workout day and raise previous records by 10, 20 or more pounds. Therefore, the power trainer cannot set down any workout schedule. He will have to train more or less frequently each week, dependent entirely upon his workout energy. Once he learns how to adjust his training to his energy, his power will really soar. Perform a few light, warmup repetitions of the particular exercise. Take a short rest and add 10 to 20 pounds. Perform 2 or 3 repetitions with that weight. Add another 10 or 20 pounds and perform 2 repetitions. Keep adding weights and from that point on perform only ONE repetition with each weight. When you hit your limit for the day, take a rather long rest and they try that same weight again. Regardless of whether you succeed or fail, right then is the time for you to quit. If you are training on two exercises, then after a fairly long rest, follow the same plan with the second exercise. 3.) The lifter who is power training will be using tremendous poundages in his exercises, and will need a lot of sleep and rest to recuperate from workout to workout. 10 hours sleep is not too much and when not sleeping or exercising, as much rest and relaxation as possible should be obtained. You simply cannot run around, stay out late play sports or keep busy and active during the day and build up your energy to a high. You must rest, sleep a lot, relax and take life easy. If you do, you will have fewer low energy days and will register faster improvement. 4.) A very substantial and satisfying diet must be followed by the lifter in power training. Steaks, chops, roasts, eggs, beans, nuts, cheese and other muscle and strength building foods should be eaten in ample quantities. Wholesome deserts such as tapioca pudding, cup custard, rice pudding and so on, are beneficial since they contain a high energy factor. 5.) To break personal strength records, YOU MUST BE CONVINCED THAT YOU CAN! If you are not confident, and if you permit any doubts to enter your mind, you will be licked before you begin. Regardless of how much below the records of others your present marks are, never doubt for a moment that you CAN reach these records and exceed them. The mere fact that others have been able to lift tremendous poundages should be a source of inspiration to you. With the rather general discussion about exercise principles now behind us, let us once again embrace the main topic, namely – deltoid development. Since the deltoid is composed of three muscle parts – a front, a side and a rear area – it is reasonable to expect that in certain instances there may exist a condition of lopsided of disproportionate development within the muscle as a whole. Bench pressing, as an example, places great emphasis primarily on the frontal deltoid area. If you have been a bench press specialist, then this section of the deltoid my be out of proportion to the others. Side lateral raises place developmental stress primarily on the side deltoids, and if this has been one of your favorite deltoid exercises, the side area may be most pronounced. Bent forward rowing and bent forward lateral raises activate the rear head of the deltoid, along with the upper back muscles. If you have spent a lot of time with these and little time with other deltoid exercises, your rear deltoids may be more highly developed than the side or frontal portions. To even off such disproportion as quickly as possible, you should specialize on the below par portion for several months. In the exercise descriptions which follow at a later point in this text I will call your attention to the area of the deltoid which is influenced most directly in an exercise so that you can select those you need to even off disproportionate development. While the training principles set down in this text will benefit the vast majority of readers if followed closely, we must not overlook the truth that not all lifters respond according to the norm. Some, due to their specific types, must adjust their training and follow a different pattern from the generally accepted version. Among the vast majority of lifters, low repetitions and a cheating exercise style produce maximum bulk. Definition, on the other hand, is generally acquired by those who perform higher repetitions, use light weights and who adhere to a more strict exercise form. However, in certain cases, due to a variance in physical and emotional type, an individual will find the exact opposite to be true. He will bulk up on high repetitions and become more muscular and defined with lower repetitions. This means that if you do not respond to the principles set down here, it in no way indicates that you cannot be successful. What you will have to do is to experiment to some extent, try different arrangements of sets, repetitions and exercise style until you hit the one which fits you best. So give a fair test to the exercise principles explained here. But if they do not work for you, you may be one of the exceptions, and you will have to experiment to find the exercise pattern which is your ideal. You must fill each workout with real training drive to bring results. Merely going through the exercise motions and hoping for success is not enough. 1.) Exceptional muscle soreness which lasts from workout to workout. A certain amount of stiffness after a workout is normal. But, if the muscles retain such an ache that you find it uncomfortable to work out, then you are training too hard. 2.) A decrease in power. 3.) A loss of training interest. 4.) A lessening in training confidence. 6.) Inability to sleep as soundly as before. 7.) A decline in normal appetite and in your enjoyment of food. 8.) A generally tired and listless feeling. 1.) Muscles do not flush up during a workout. 2.) There is no sign of muscle soreness after a workout. 4.) Your muscles are not growing and your power is not increasing. 5.) Your body lacks hard muscularity. 6.) Workouts are a breeze; don’t make you feel tired at all. 7.) You don’t have any real bodybuilding goal in mind. You are merely taking your workouts because you feel that it is the thing to do. If these mental and physical conditions exist, then you are not training hard enough or taking your workouts as seriously as you should. Step up your training efforts and establish a real lifting goal and you will speed up improvement. Exercise 1. One Arm Press – Start, holding a dumbell at the shoulder with one hand, the free hand holding onto a support. Bend the body at the waist toward the side in which the weight is being held, and then snap the body back and press the weight overhead. Lower to the shoulder and repeat. Exercise both arms separately and for the same number of sets and repetitions. Exercise 2. Two Dumbell Jerk Press – Stand erect and hold a dumbell in either hand, weights at the shoulders. Bend the knees slightly. Snap the legs to a stiff-knee position and while doing so press the dumbells overhead. Put a real drive behind the exercise and you will be able to lift very heavy poundages. Lower the weights back to the shoulders and repeat. Exercise 3. Circling Lateral Raise – This exercise is one of the rare ones which develop all three heads of the deltoid – front, side and rear. It is not much of a power builder, but it does flush up the entire deltoid process. To perform the exercise, stand erect, one shoulder braced against a wall or some upright support. Now, in a circular motion, raise the dumbell away from the thigh and about half-way between the thigh and shoulder height position. Circle back down to the thigh and continue to circle the dumbell in gradually widening circles until it is circled from the thigh right up to the shoulder height position shown in the illustration. Then, gradually decrease the size of the circle until the weight is back at the thigh. In this exercise, repetitions are not counted; the exercise is continued until there is such a strong ache in the shoulder that further circling repetitions are physically impossible. Exercise 4. Bent Arm Laterals – This is a typical cheating exercise. As such, it will build great size and power in the deltoids. Start the exercise in the position shown in illustration 4. Keep the palms facing up as shown, to relieve unnecessary strain on the shoulders, and keep the elbows bent throughout. With considerable body motion to help you lift limit poundages, raise the weights to the sides and above the head. Lower to the starting position and repeat. Exercise 5. Dumbell Pull Up – Start with the dumbells held at the thighs. Pull up to under the chin as in the upright row. However, do not stop the movement there. Continue the upward pull by shrugging the shoulders back, dropping the elbows and turning the weights over so that the palms of the hands are facing the front. Think of this as cleaning without lower body motion and racking the dumbells at the shoulders. Then, press the weights to overhead. Reverse the procedure and lower the dumbells to the thighs. Repeat. Exercise 6. Bent Over Lateral Raises – Bend forward, a dumbell held in either hand, arms at full stretch toward the floor. 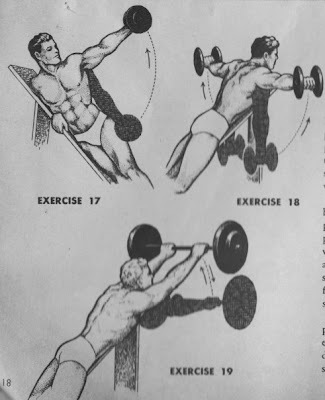 Swing the weights back and up to the position shown in illustration No. 6. Try to hold weights at that position for a count of three, and then lower to starting position and repeat. Exercise 7. Dumbell Rowing – This exercise places great stress on the rear deltoids and can give them great power. Start with body bent forward, a dumbell held in one hand, arm at full stretch toward the floor. 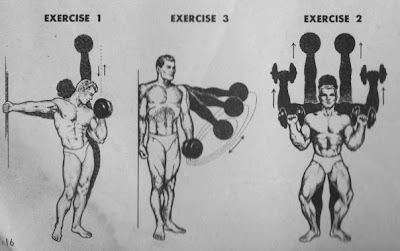 Use considerable body motion and pull the dumbell up to the shoulder as indicated in the illustration. Lower to the starting position and repeat. Exercise 8. 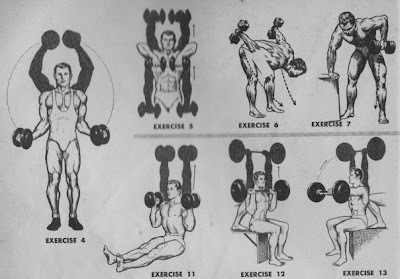 Dumbell Roll Out – Start in regular floor dip position, a dumbell grasped in each hand. Roll the dumbells out to the sides as far as possible and then draw them back to the starting position. At first, you may only be able to roll out 8 to 10 inches to each side and still maintain control of your body. However, with practice, in time you will be able to roll out until your arms are completely stretched out to the sides. When you can perform 6 to 8 repetitions with bodyweight only, place a light barbell on the upper back to supply extra resistance. This is quite a severe exercise. Exercise 9. Upright Rowing – Stand erect, a barbell held at the thighs, hands in a close to medium grip. Use some body motion and pull the barbell up to under the chin. Try to hold at this under the chin position for a count of three. Lower to starting position and repeat. Exercise 10. Incline Bench Rowing – For working the rear delt muscles together with the upper back, this is one of the best. Lean forward on an incline bench. Have a training partner lift up a barbell so that you can grasp it in your hands. Pull the barbell up as high as possible, and lower to full arm’s stretch toward the floor and repeat. Exercise 11. Seated On Floor Dumbell Press – Since the amount of weight that can be used with this exercise is rather limited, it will not build much power, but it does offer variety and a way of strictly targeting the pressing muscles without much involvement of other muscle groups. Sit on the floor, legs outstretched, a dumbell in either hand at the shoulders. Press the dumbells overhead. Lower to the shoulders and repeat. Exercise 12. Seated Barbell Press – Due to the improved upper body support, plus the substitution of a barbell for dumbells, much heavier poundages can be used in this exercise relative the last one. This extra weight, of course, will produce more bulk and power than the seated dumbell version and is very valuable for that reason. Sit on a flat exercise bench a barbell held at the chest. Have a training partner press a knee against your back to lend support to the upper body. Lean back against the knee and press barbell to arms’ length above the head. Lower to the chest and repeat. Exercise 13. Seated Hold Out To Front – This is a very strenuous front deltoid exercise. Sit on a flat exercise bench and have a training partner lean support to your upper body by placing a knee against your upper back. Hold a barbell at arms’ length above the head. Keep the elbows locked and lower the barbell to the front as shown in the illustration. Hold firm for a count of two and raise weight, with stiff arms, to overhead. Repeat. Exercise 14. Lying Rear Laterals – Lie face down on a high exercise bench. Hold a dumbell in either hand, arms at full stretch toward the floor. Swing the weights slightly and raise the dumbells to the rear as far as possible. Hold the rear position for a count of two. Lower to the starting position and repeat. Exercise 15. Barbell Shoot Out – Lie face down on a flat exercise bench. Hold a light barbell behind the neck, then shoot the arms directly to the front and hold weight in that position for a count of two. Pull weight back to behind the neck and repeat. Exercise 16. Bench Press – Marvin Eder, George Eiferman, Reg Park and others who handle 400 and more pounds in this exercise are irrefutable proof that it brings results. Exercise 17. Incline Bench One Arm Side Laterals – Lie sideways along an incline bench. Hold a dumbell at the thigh in one hand. Raise the dumbell up directly to the side as indicated in the illustration. Lower to the thigh and repeat. Exercise 18. Incline Bench Side Laterals – Lie face down on an incline bench. Hold a dumbell in either hand, arms outstretched toward the floor. 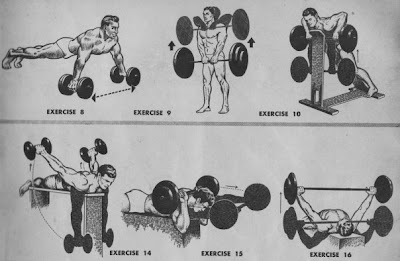 Raise the dumbells directly to the sides and up as shown in the illustration. Lower to the starting position and repeat. Exercise 19. Peak Contraction Rear Deltoid Exercise – Here is a short-action, peak contraction movement for severe and direct rear deltoid exercise. Lie face forward on an incline bench. Hold a barbell in the hands, arms extended directly to the front and raise as high as possible. Lower the weight about 18 inches and then immediately raise again to the starting position. Decide exactly what your deltoid specialization aim is: power, bulk, definition, or else to overcome a proportional defect. For bulk training, pick 4 different deltoid exercises. Perform 3 sets, 6 to 8 repetitions a set. If you combine these deltoid exercises in an all around routine, perform them FIRST in the program when your energy is highest. Then, follow them up with exercises for the rest of the body. Do not train more than three times a week if you follow this plan. If you prefer a split routine of training, then perform the 4 deltoid exercises on 2 or 3 training days a week. Then, on another alternate 2 or 3 days a week perform exercises for the other parts of the body. For definition training, select 6 to 8 different deltoid exercises. Perform each 3 sets from 15 to 20 repetitions a set. Perform these exercises first in your routine and then follow up with between 12 and 15 exercises for the rest of the body. Train the entire body in this manner 5 to 6 times a week. If your aim is power, then select only one or two different deltoid exercises and follow the instructions for power training previously outlined. Use weights which give you a real fight, but do not produce undue and continuous strain at each workout. Take advantage of especially energetic periods to push harder than usual. Whenever a weight begins to feel a bit light in any exercise increase it by a few pounds, but do not jump exercise poundages too high at any one time. It is better to make gradual and regular increases than to add a lot of weight all at once.